Finding a home for a large theatre pipe organ is no easy task. The Biblical phrase “Many are called but few are chosen” was never more true, though in this case perhaps in a different context. Over 70 potential locations were identified and scrutinised, not only for the technical feasibility of installing the organ, but also for the acoustics, the suitability of the building and its environment and not least the commitment of the location owners to act as partners in a venture that would involve major changes to their property. Last and not least, the Trocadero Wurlitzer would have to be available for public enjoyment, practice and use. Although several came close, it was the Troxy Stepney that won the day after five years of searching and in a way that few dared dream. The building provides the perfect acoustic match for the instrument. It had organ chambers, left over from another long-departed Wurlitzer, easing the installation of the replacement (yet much larger) instrument. The venue provides high quality music, entertainment and conference facilities. 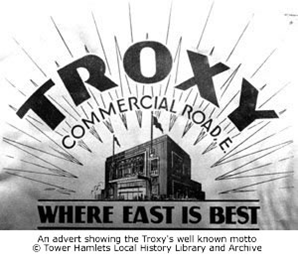 Not least, the owners demonstrated positive enthusiasm and support for the project and, by one of those uncanny twists of fate, the Trocadero was a sister cinema to the Troxy. T2T, “Trocadero to Troxy”, was born. Very significantly, this was the first installation of a major theatre pipe organ in a British super cinema since the 1930’s. Once the scale of the task of providing organ chambers, refurbishing and installing the instrument became known, the Cinema Organ Society, who own the organ, set about considering ways of funding the project. A reinstallation fund had already been set up when the organ was removed from its previous home at the London South Bank University and, through the generosity of the University and of members’ donations and bequests, the fund stood at around £100,000. Accurate costing indicated that a further £175,000 needed to be raised to complete the project and with this in mind, and recognising the advantages of charitable status, a decision was taken in 2010 to set up a charitable trust to give the most beneficial and focussed approach to fundraising. Hence the Trocadero Wurlitzer Trust was set up and the project started in earnest. Work began in early 2010 to plan both the fundraising and technical work required. The Trust launched its appeal for funds in September 2010 and achieved its goal at the end of 2013, thanks to sponsorship from various organisations and the remarkable generosity of organ enthusiasts internationally. At the same time as the Trust commenced its appeal, the technical team of the Cinema Organ Society began the massive task of restoring the largest Wurlitzer organ to come to Europe. During 2011 the organ chambers and other spaces needed to accommodate the organ in the Troxy were prepared and by the summer of 2012 installation of the instrument began. As the Troxy is a busy venue, installation work had to be completed when the theatre schedule allowed and as restoration was completed on the various sections of the instrument. The Main organ played first in summer 2014 followed by the Solo organ in spring 2015. The completed instrument made its public debut in August 2015 to great acclaim. For events at the Troxy, see the Troxy Wurlitzer website.